Please refer to our stock # BNJcactusPow when inquiring. 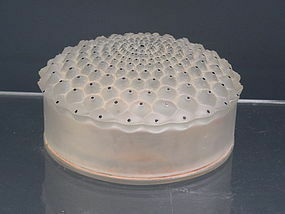 Hard to find Lalique Crystal cactus powder box featuring frosted glass with black dots. It still retains some of the original powder as seen in the photos. The only condition issue is a chip on the base, which is reflected in our price (without the chip this would sell for about $550). Dimensions: 4" diameter x 2.5" high. We also have a matching perfume bottle for $450, see last photo. 10% discount if you buy both pieces.